This is the second in a series spotlighting South Side clothing stores and businesses. What makes fashion icons such as Zendaya, Solange Knowles, and the beloved fictional fashion maven Carrie Bradshaw stand out? Well, their style, of course. Whether it be gracing Vogue or the red carpet, these women (and characters) have embraced a style that is truly one-of-a-kind. To Tamika Maria Price, founder of Standout Style, these celebrities and, perhaps, the stylists behind their looks, stand out because of their ability to be bold, free, and even experimental. The same could be said about both the women who shop at and the owner behind this truly special Bridgeport clothing boutique. Tamika Maria Price, like the brand she has created, certainly stands out. Her outgoing spirit and personality are laced with a story of overcoming struggle—a motivation for budding female entrepreneurs. Growing up, Price had to deal with homelessness throughout most of her teenage years. She was determined that when she became self-sufficient, she would never be in that situation again. While working in corporate America, like any true entrepreneur, Price began a side business as a personal stylist. In 2008, she fully pursued her passion and launched A-Line Style Services. As Price’s business began to build, both local and national figures definitely took notice. Within six months of starting her business, Price received a call from the Rachael Ray show to be featured as an on-air stylist. Throughout her early career and even now, she reflects on how her years of being homeless impacted her journey to success. Her struggle prepared her for entrepreneurialism. “It prepped me for the stresses and for the hard times, because I am not a stranger to hard times,” Price said. Reflecting on those difficult days has kept Price moving towards bigger and better business ventures such as her Standout Style boutique. Standout Style was launched in 2014. Discouraged by the lack of options for curvier, everyday women, Price decided to open her own boutique where women from sizes XS to 3XL could find a look that worked best for their body type. She created a boutique for the “Shop Style Girl.” With the evolving fashion taste of the Midwestern customer, it was important for Price to embrace and carry pieces designed for the women she knew how to style well. “I have always been able to style curvy frames,” said Price. These women epitomize the Standout Style girl. “She loves wearable style,” she said. “She likes trends, but also loves classic style too.” The Standout customer is someone who is on the go, whether that be the busy mom or the bustling entrepreneur. She is a woman who wants great style, but “without the sticker shock,” Price said. Price’s clothing store is not just a store, but a truly standout experience for every woman that enters through the door. Price relocated her shop to Bridgeport for a more convenient shopping experience for her faithful “standout clients.” Of course, the bigger space and free parking also aided in her decision to move to the neighborhood. Price describes her boutique as “experience intensive…We are a place where girlfriends meet.” Upon entering Standout Style Boutique, you can expect one-on-one service, being offered a beverage, honest styling experience, and my personal favorite: a really great music playlist. Price does not want any of her customers to feel like they do not belong or that they have entered into “just another clothing store.” In addition to exceptional customer service, the place where “girlfriends meet” is an extension of the shopping selection at Standout Style. 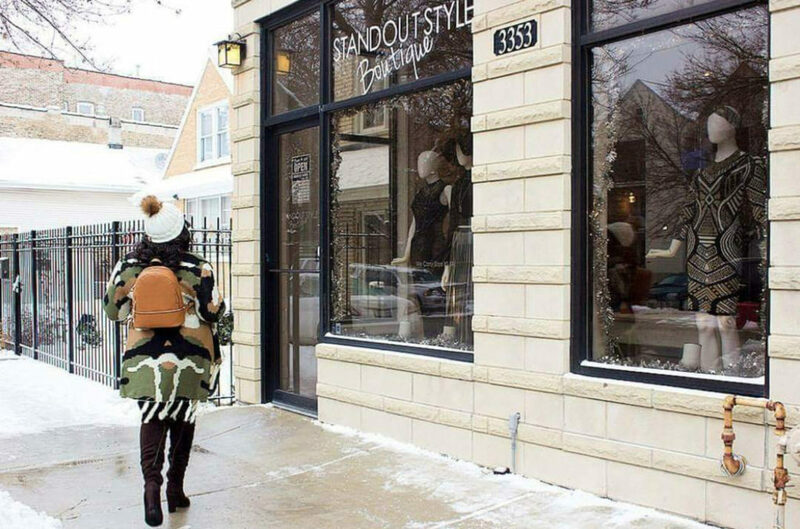 At this South Side boutique, shoppers will also find an array of local designer goods from fellow shop owners and other budding female entrepreneurs. Price carries local designers such as South Side jewelry designer and shop owner Mashallah, Passport by SP, and hatmaker Angela Morano. Price sees collaboration as highly valuable to her business and to her store’s personal shopping experience. She has held several collaborative events with local bloggers and fellow shop owners and says that it is, ultimately, a “win-win.” Collaborating rather than competing has led Price to experience other opportunities, like her successful, ongoing Boss Babe pop-up shop located at Block 37 on State Street. 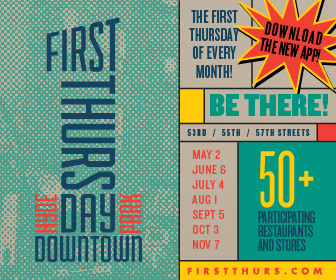 The pop-up has generated some great buzz for her brand and exposed the brand to new clientele who prefer the convenience of the downtown in-person boutique experience. After celebrating three years this past month, Tamika Price is in continuous pursuit to expand her standout brand. Within the next few months, Price plans on offering private label Standout Style footwear, so that her customers can be styled from head to toe. Outside of the boutique, she plans to release a book that will focus on one of her biggest passions, female entrepreneurism, and she will continue to focus on building a community of women entrepreneurs in the city of Chicago. Price is certainly, if not already, well on her way of making Standout Style, a “must shop” boutique in the city of Chicago. Standout Style, 3353 S. Morgan Street. Wednesday-Friday, 12pm-7pm. Saturday and Sunday, 12pm-5pm. Boss Babe pop-up shop location, 108. N. State St. Monday-Saturday, 11am-7pm, now through March 31, 2017. Taylor Justin is the founder of The Haute Seeker, a Chicago-based cultural lifestyle blog. She currently lives in Pilsen and enjoys art gallery hops, vintage thrift shops, and exploring South Side eateries with a few great friends. Nice to read. So useful and informative tips. Thanks for sharing!